Captain Jim Ross of Rockledge, Florida, has been guiding on the waters of the Mosquito Lagoon, Indian and Banana Rivers, and the Atlantic Ocean outside of Port Canaveral for the past decade and a half. Ross is an expert at light tackle “sight” fishing on the flats and live baiting the near shore Atlantic waters. Just depending on the day, Ross can been seen at the local boat ramp fishing out of his Skeeter 22’ Bay Boat or Pathfinder 17’ tunnel boat, both powered by Yamaha outboard motors. Ross was a National Champion Team member on the under 23’ Southern Kingfish Association (SKA) tournament trail. 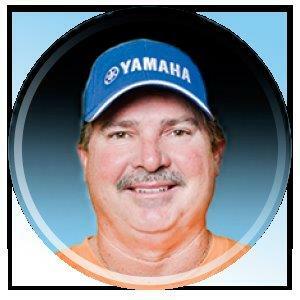 He is a participant fishing in the SKA-Kingfish and IFA Redfish tournament trails with several top ten finishes. In addition to his guiding business, Ross is also a Skeeter National Fishing Team Member, Radio Show Host for past 14 years, has filmed multiple Television appearances over the past eight years and has been an Outdoor Writer for the past 15 years. Sponsors include: Skeeter Boats, Yamaha Motors, Lowrance electronics, Tru-Turn Industries, Saltwater Assassin Lures, Carroll Distributing (Bud Light Beer), Lamiglas Rod Company. Rapala Lures, Sufix braided Superlines, Shimano reels, Hook Up lures, Pro-Cure bait Scents, Minn Kota trolling motors, and Costa sun glasses.